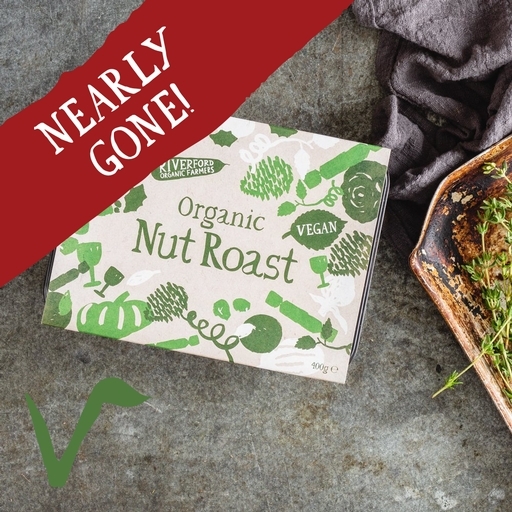 Rich, flavoursome organic nut roast, for a really tasty vegan or vegetarian Christmas. Our recipe is bursting with festive chestnuts, walnuts, almonds, amaranth and butternut squash, with a good, firm texture for easier serving. Ready to cook, with no prep needed, it makes things easy on the big day. Even the carnivores in our kitchen wanted a piece! Serves 2-3. Easy as can be – just pop it straight into an oven preheated to 180°C/Gas 4 and bake for 25 mins, or 45 from frozen. Keep in the fridge. If you’re not going to eat it within a day or two, freeze your nut roast as soon as possible and always within the use by date. The recipe for our new nut roast was specially developed for Christmas by Riverford cook Kirsty. It’s made for us by the good people at Pegoty Hedge, using 100% organic ingredients, including our own slow-grown veg. Butternut Squash, Amaranth, Walnuts, Cashew Nuts, Chestnuts, Onion, Celery, Carrots, Almonds, Brown Rice Flour, Sunflower Oil, Lemon Juice, Garlic puree, Brown Rice Miso (Whole Soya Bean, Cultured Brown Rice, Sea Salt*, Water*), Worcester Sauce (Molasses, Tamari Sauce (Soya Beans), Sugar, White Wine Vinegar, Garlic puree, Water*), Parsley, Tamari Soy, Vegetable Bouillon (Rice Flower, Sea Salt*, Maltodextrin (from Maize), Vegetables (8.3%) (Onion, Carrot, Parsnip, Pumpkin), Yeast Extract, Sunflower Oil, Turmeric, Mushrooms (White, Shitake), Parsley, Concentrated Vegetable Juice (Onion, Carrot), Lovage, Garlic, Fennel Seed), Dried Mixed Mushrooms, Rosemary, Salt*, Black Pepper. Prepared in a kitchen where dairy and wheat are also handled.